On November 6, we teamed with The Meanwhile Film Series to host the Mosaic Mobile college night. 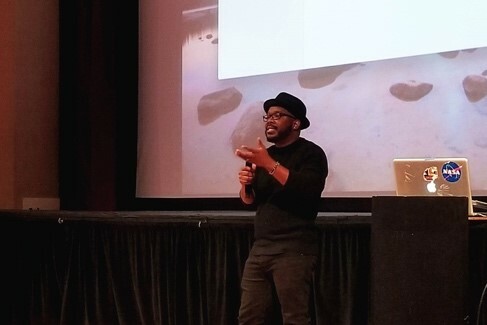 More than 100 community members filled the Wege Auditorium at Wealthy Theatre for the event, which included a screening of the 2018 Mosaic Mobile college category finalists and an exclusive presentation from Hollywood costume concept artist Phillip Boutte Jr. Boutte spoke to the audience about his career journey and creative process; then the night was capped off with a special screening of one of Boutte’s latest projects: Black Panther. The night began with a screening of the top three Mosaic Mobile finalists in the college category. Mosaic Mobile is an annual short film contest for West Michigan high school and college students. Its goal is to develop students’ storytelling skills. Each participating student is required to film, edit, and submit their films using mobile devices exclusively. Event attendees were noticeably impressed with the films that were screened. Between screenings, volume in the auditorium rose, and audience members were overheard raving about the students’ creativity. Following the screening, the winners were announced and were awarded their prizes. 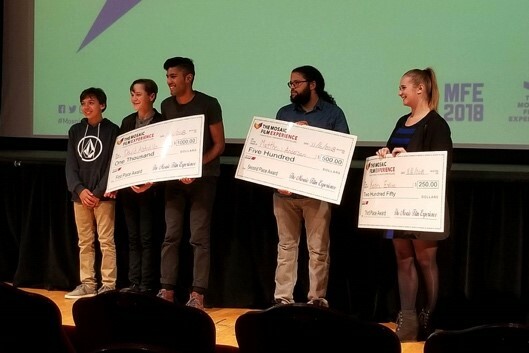 Watch the 2018 Mosaic Mobile College Winners and Finalists on YouTube. Following the Mosaic Mobile award ceremony, we welcomed friend of The Mosaic Film Experience Hollywood Costume Concept Artist Phillip Boutte Jr. to the stage. Boutte has worked on countless Hollywood blockbusters such as “Black Panther,” “The Greatest Showman,” “Guardians of the Galaxy Vol. 2,” “A Wrinkle in Time,” “Inception,” “The Hunger Games,” “Bohemian Rhapsody,” and many more. 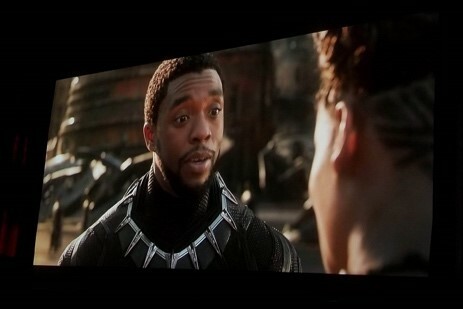 Boutte presented his newest project highlight reel, which was met with a stirring ovation, and told the audience about his creative journey during the development of “Black Panther.” He shared the stages of costume design from start to finish. He conveyed that, from concept through to finished product, the entire process is both highly involved and collaborative. Boutte emphasized how important it was to have a film that was able to capture African culture. Growing up, Boutte said he struggled with the lack of representation of minorities in the media. Now, he’s proud to develop characters that break out of media-enforced stereotypes. Then, with a screening of “Black Panther” to finish the night, attendees were able to experience Boutte’s creative process come full-circle. “Phillip Boutte Jr. is a brilliant artist and wonderful role model for those who feel underrepresented in Hollywood and mass media,” said a student in attendance. The atmosphere inside Wealthy Theatre was glowing with positivity during the 2018 Mosaic Mobile college night. Attendees reveled in the opportunity to both celebrate our community’s talented student filmmakers and to be inspired by the world-class creative work of Phillip Boutte Jr.